East Terrace, Area 1, Section: Wall 1. I have finally closed another Chapter, I have finally found our 3 x Great Uncles resting place. 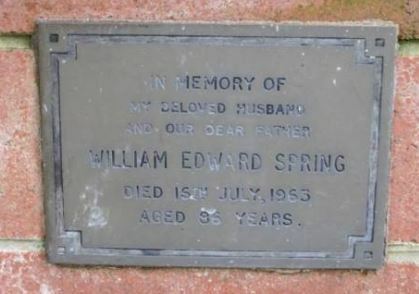 William Edward Spring, born 1879, to James and Julia (2nd Wife) at Grafton NSW. William went to live with his Step sister after the deaths of his Parents, James 1886, Julia in 1890. In 1902, he joined the Army to fight in the Boar War. He made it to Africa in time to come home again, once he got back, he joined the NSW Police Force in 1902, and retired as a Inspector 1n 1949 and resided in Hornsby (Sydney) until his death in 1963. His second wife Violet passed away the following year – 1964. TWYFORD. – The Friends of Constable William SPRING, of Redfern, are kindly invited to attend the Funeral of his late beloved Brother-In-Law, George William Twyford ; to move from his late residence, Rawson avenue, West Kogarah, This ( Thursday ) Afternoon, at 2 o’clock, for Sutherland Cemetery. Furniture Sale. WEDNESDAY, NOV. 26TH T. H. ELWIN has received instructions from Constable W. E. Spring, who is leaving for Sydney, to sell by public auction at his residence, the Police Station, Narandera, on the above date, at 2.30 o’clock, all his household furniture and effects, comprising : Dining tables, Austrian chairs, single and double bedsteads, wire mattresses and bedding, washstands and ware, duchess chests, linoleums, crockery, kitchen and laundry requisites, etc., etc. NO RESERVE T. H. ELWIN, Auctioneer.